Crossing the Tigris river from Iraqi Kurdistan marks the entrance to the Northern Syria, a de-facto autonomous area in the north of Syria, the country martyred by seven years of war. 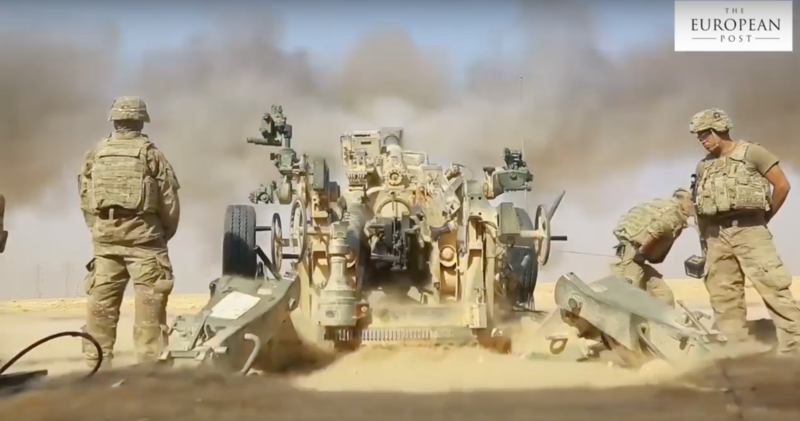 The US-backed Syrian Democratic Forces (SDF), the Kurdish, Syriac/Assyrians, Arab and Turkomen military alliance, are still fighting what remains of DAESH in the East of Euphrates. 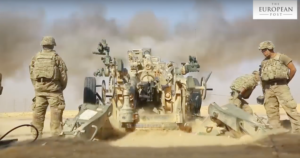 The US army continues to strike the area still under control of the black flags of ISIS in the Middle Euphrates River Valley. Planes are bombing non-stop, preparing the military incursion of the SDF inside the villages. 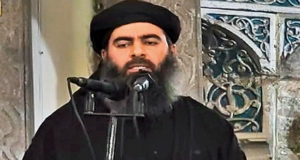 Despite the fact that many soldiers hid behind a ‘no comment’ when we ask about the possible presence in the area of the Caliph Abu Bakr Al-Baghdadi, the lord and master of the Islamic State, Iraqi intelligence officer recently revealed that he is hiding in eastern Syria and only moves around with a small group of followers, including one of his sons. We leave the Syriac Military Council soldiers’ barrack early in the morning to travel to areas newly liberated from ISIS. The siren of our military vehicle resonates at every check point. No less than twenty military security checks separate us from the frontline. The Christian soldiers escorting us explain that we are in a predominantly Arab zone. Men with long beards and women wearing niqab are ever present in the territory. 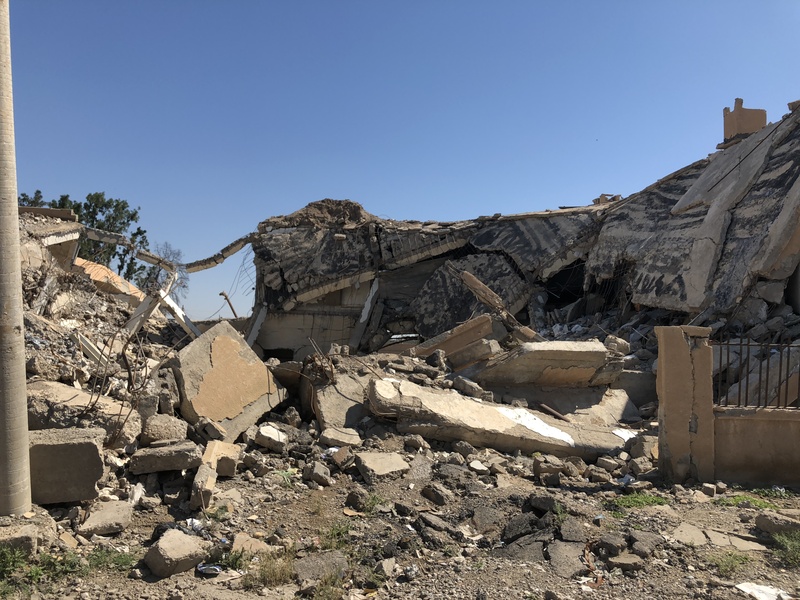 As we drive along, the destruction of the cutthroats is palpable everywhere, but there is a huge difference: while the Arab villages are generally damaged by the recent battles, life there is still possible in some ways. 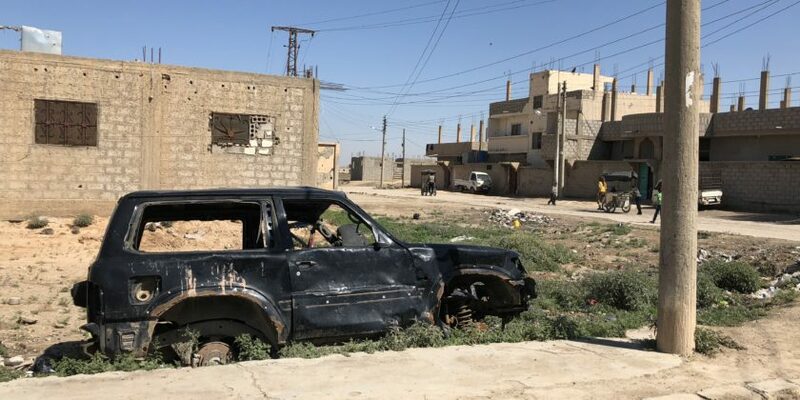 On the contrary, Christian villages in other areas of Syria were completely burnt down in order to avoid a return of the Christians to live in their land. Arriving in a small village just freed, we pass the last check point controlled by Christian forces before the dirt road starts and a sandstorm blocks us. A graffiti written at the entrance of the outpost of MFS welcomes us: “DAESH will remain here, if Allah wills!” Just in front of it, Christian soldiers are proudly showing us their tattoos with crosses and rosaries, a stark contrast between the Islamist motto and their Christian faith. 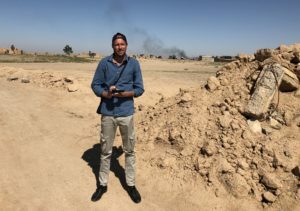 “There is not as much resistance as there was in Raqqa,” Ghout, a 32-year-old soldier who also fought inside the former capital of the Islamic State, tells us inside the camp. He is very nervous since he’s been stuck here and couldn’t go fighting this day because of the sandstorm. “In two months all the area will be cleared. I hope to go back to the fight tomorrow,” he said confidently. “Around 2,000 ISIS fighters are still active in this area but no official information regarding Al-Baghdadi presence is confirmed,” Shori, the 21-year-old responsible of the camp, says. “ISIS prisoners will be judged differently according to their actions: the one who were involved in the fighting will be judged firmly but all the others, after a period of captivity, could be released,” he also revealed. On the top floor of the outpost, soldiers are on the alert, scrutinizing the panorama ahead with their weapons in hand and ready to fire at any time. Attack of the last jihadists present in town could happen at any moment. Nisha Gewriye, spokeswoman of the Syriac Christian women fighters, tells us how much the jihadists are scared to fight against them because if they are killed or wounded by a woman, they will not go to paradise with the virgins promised by the Koran. Contrasting with the alarming situation of danger and suffering, she speaks with a contagious smile and stands a strong woman, along with all the other women who took up the arms against DEASH. 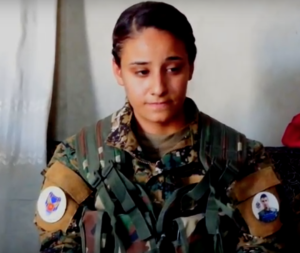 “We invite all the feminists from Europe and Western countries to join us in this fight so we can permanently defeat DAESH as soon as possible,” she says. We move closer to the frontline, crossing streets opposite areas still under ISIS control. All soldiers know their war has not ended yet. They have to finish with ISIS but they will still have to struggle afterwards, to have their rights recognized in post-war Syria. 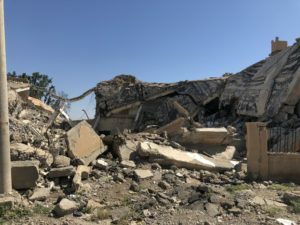 Citizens of Northern Syria, including Kurds, Christians, Arabs, and Turkomen, want to be considerate as one of the players for the Syria peace talks, in Geneva and Astana. With their commitment and with the price they paid in terms of human lives, they ask the International community to invite them to the table of peace and to not leave them alone like the International community did when it let Turkey invade Afrin at the beginning of 2018.